Easy to work with! The dough for these Cream Cheese Sugar Cookie Cut-Outs is just perfect. Not only is rolling and cutting this dough pleasant, but the taste and mildly tart flavor of the baked cookies is good. Also, the texture is extremely light. Update: I still use this recipe quite often. These days I like to divide it into 4 parts, set each part between two pieces of parchment paper, roll 1/4 inch thick slabs and freeze. In addition, I sometimes add 1/4 teaspoon of the elusive McCormick Vanilla, Butter & Nut extract. It’s hard to find, but it adds a nice flavor when used in small amounts along with the regular amount of vanilla. And finally, what I really like about this recipe is there’s no baking powder flavor. Not that baking powder flavor is a huge deal, but sometimes you can taste it in sugar cookies, and in this case that’s a non-issue. 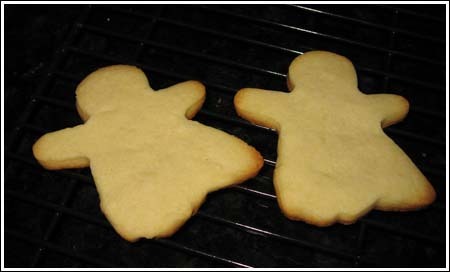 Cream Cheese Sugar Cookie Cut-Outs are made from a dough that's easy to work with. The cookies do not have any baking powder or baking soda, but are tender and light thanks to the cream cheese. In a large mixing bowl, beat the butter, cream cheese and salt until fluffy. Scrape sides of bowl and beat in the sugar. Beat for about 2 minutes, then add the egg yolk and vanilla and beat just until mixed. By hand, stir in the flour to make a thick dough – it should be moist, but not too sticky. Divide it in half and shape into two balls. Press the balls into discs and chill for a few hours. When ready to bake, take a section of the dough out of the refrigerator and roll to 3/8 inch thick on a well floured surface. Alternatively, you can divide the dough into 4 sections, roll each section between two sheets of parchment, and freeze each section. Cut the shapes from the frozen dough. Bake cookies in a preheated 350 degree oven for about 10 minutes. The cookies do not spread or puff and they taste great! The yield will vary depending on your cookie cutter. Using medium size cutters you'll get between 20 to 24 cookies. Note: For convenience, I divided the dough into two parts (as stated above) then set each part on a big sheet of non-stick foil and pressed each part into a big 3/8 inch thick circle. I covered the circles with another sheet of non-stick foil and chilled the big circles for a few hours. When I was ready to do the cutting, the dough was firm and the cut-outs popped right out with the cutters. My husband loved the cookies so much he wants to have them at a dinner party next week as dessert with ice cream and caramel. So, I was wondering… Do you think the cookie dough will freeze well? 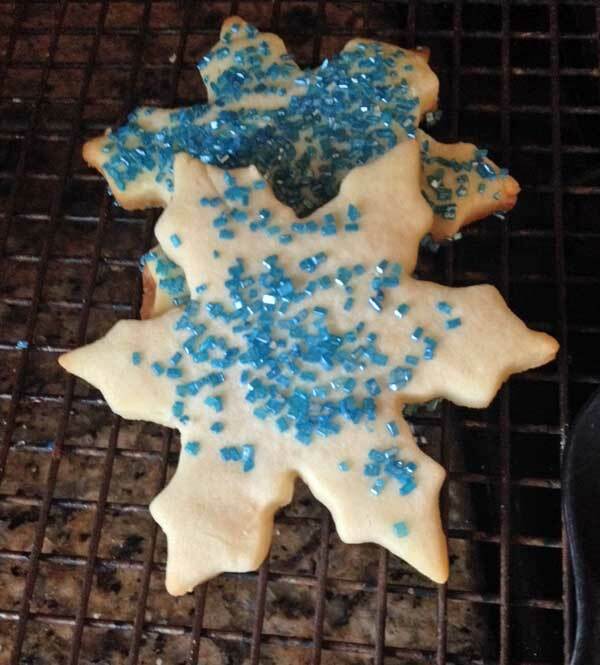 ?…Can I freeze the cookie cut outs between layers of parchment paper? Or should I bake the cookies and freeze them already baked? Thank you so much again for your help and wonderful blog! Thanks for the review! This is a really good recipe, but I think a lot of people don’t know about it. Maybe magazines will print versions of it around holiday time. We’ll see. I’m not exactly sure where I found this one, but as Mary said above, the source is probably Pillsbury. Today I baked the cookies for the baby shower from the dough I had prepared a couple of days ago and they were great!. The taste is delicious!! They were really what I was expecting. I sprinkled them with confectioners sugar and wrapped them in individual bags. They looked and tasted amazing. Thank you Anna for the recipe and your help! About your sugar cookies, I recommend making the dough a few days ahead of time and baking the cookies no sooner than one day before the baby shower. Hope that helps! I was wondering if you have any idea how much time in advance can this cookies be baked? I am planning on making them for a baby shower later this week and I rather have them ready a few days before. I would appreciate if you let me know. Yes, I just pressed the dough. No rolling. Sometimes I like rolling dough, but I have to be in a certain mood. If the dough is such that I can get away with just pressing it down, I do. You’ll need to press it down before chilling, though. Otherwise, it will be too firm. I guess the only drawback to this method is it takes up more room in the refrigerator because you have to chill your big, flat, pressed out mass of dough. These look awesome. I was wondering, do you mean that you did NOT roll out the dough, but rather pressed it? I am the WORST roller-outer 🙂 of dough ever, so I am curious to see if I may have found a new method! Thanks for stopping by Cookie Madness! To answer your question, no — putting the egg white in isn’t something I would recommend. I suspect it would make the cookies chewy. The texture of the cookies is crispy. Also, if you only have a tiny amount of cream cheese (1 1/2 oz), you may halve this recipe. To halve an egg yolk, just crack the egg into a bowl and spoon out half the yolk. Hi! I’ve been meaning to find a use for the leftover cream cheese in the fridge and this recipe sounds perfect. Thanks! Would there be a big difference if I included even the egg white in the dough? Amy, if you’re going to mail them, you might want to make them a little thicker than 3/8 inch. They’re not delicate, but they might break in shipping if they’re too thin. Mary, thanks for the endorsement. When I found this recipe I thought “Recipe, where have you been all my life?”. This is also a good way to use up leftover cream cheese.It makes sense that it came from Pillsbury. I found it on the Internet and it didn’t have a credit. This is my all time favorite cookie- I’ve been using it for over 20 years. My recipe came from a Pillsbury cookbook (I’ve looked at this book for so many years, but can’t remember the title!). The only difference from your recipe is that mine calls for 1/2 teaspoon EACH of vanilla and almond extracts. Try it. My daughter (now 19 years) calls them “Dough Cookies” because the flavor of the cookie doesn’t change much from uncooked to cooked.These are great frosted and plain.